How prophetic NSW Premier Mike Baird turned out to be when he called himself a “schmuck” during an interview about his personal matters. The only thing not stated was the magnitude of it. A professor and public administration expert has slammed the Baird government’s royal commission-style inquiry, accusing it of tailoring its witness list, misrepresenting evidence and making wrong statements in its findings against the greyhound racing industry. Percy Allan, an economist, said yesterday strict secrecy provisions, which were insisted by the inquiry, gag him and prevent disclosure of all of his criticisms of the process. But he has released an extract to highlight what he described as a bias he believes influenced scathing findings last month and the pledge by Premier Mike Baird to abolish the industry in NSW by next July. Professor Allan, the state’s former Treasury secretary and chairman of Greyhound Racing NSW for nine years until 2012, directed criticism at the inquiry’s counsel assisting, Stephen Rushton, SC. He said Mr Rushton, who led the questioning in the 15-month inquiry chaired by 80-year-old former High Court judge Michael McHugh, QC, “failed to examine all relevant evidence”. Mr Rushton did not respond when asked to comment yesterday on the criticisms levelled by Professor Allan and other industry participants fighting to save the $335 million a year industry. Mr Rushton said in his opening address last September at the first public hearing the message to government about the industry was to “shut it down”. He has been criticised for appearing to have made up his mind before a single witness to a public hearing had been sworn to give evidence. The inquiry’s final report found while Professor Allan had said the board was unaware of live-baiting, the commission “uncovered critical documents … which indicated the board and senior management were put on notice”. “Yet somehow the board members appear to have misunderstood documents that should have alerted them to the fact that live baiting in the industry was occurring,” the final report said. Professor Allan, however, said the inquiry’s finding was misleading and wrong. A key document relied on by the inquiry was not a board paper and had not been seen by him, and did not raise alarm bells about live baiting. “The Crown Solicitor’s Office later confirmed that it was not a board paper,’’ he said. Professor Allan said the inquiry had shown an “unwillingness to post submissions on its website that presented an alternative viewpoint”, raising further questions about the impartiality of evidence gathering. Greyhound racing will be banned in NSW from July next year, with owners, trainers and workers set to be compensated by the state government. Schmuck! The only thing he’s ever gotten right. You schmuck. 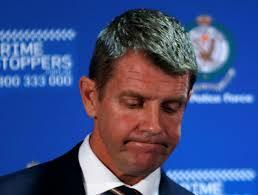 Mike Baird has become a tyrant. Next up on the banned list Mr Baird along with Newson, Grant & skinner. He’s type of polotics belong in North Korea..